Lefranc, M.-P. and Lefranc, G., The Immunoglobulin FactsBook, Academic Press, London, 458 pages (2001). The orientation of the human (Homo sapiens) IGK locus on the chromosome 2 (2p11.2) is reverse (REV). 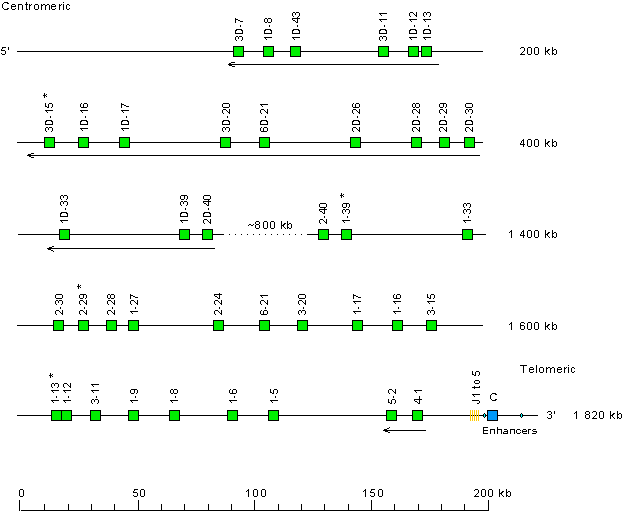 The IGKV genes of the proximal V-CLUSTER are designated by a number for the subgroup, followed by a hyphen and a number for the localization from 3' to 5' in the locus. The IGKV genes of the distal duplicated V-CLUSTER are designated by the same numbers as the corresponding genes in the proximal V-CLUSTER, with the letter D added. 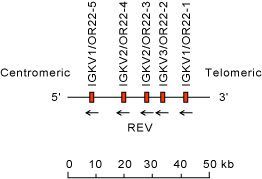 Arrows show the IGKV genes whose orientation is opposite to that of the J-C-CLUSTER. •	No 5' borne conserved between species has been identified upstream of IGKV3D-7 (F), the most 5' gene in the locus. •	RPIA (ribose 5-phosphate isomerase A) (3' borne) has been identified 106 kb downstream of IGKC (F), the most 3' gene in the locus. This representation is taking into account the polymorphic duplication in the locus (see references from Zachau's group below). Small triangles indicate parts which are absent in the proximal or distal V-CLUSTER when considering the duplication in the human IGK locus. Gene localization is according to data from IMGT/LocusView. 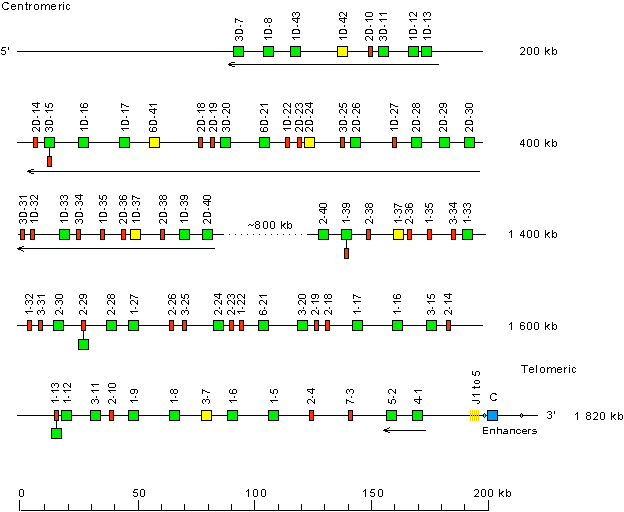 This locus representation with only the functional genes is used with IMGT/GeneFrequency. Zachau, H.G., Gene, 135, 167-173 (1993). Lefranc, M.-P., Nomenclature of the human immunoglobulin genes, Current Protocols in Immunology, A.1P.1-A.1P.37 (2000). Hüber, C. et al., Eur. J. Immunol., 23, 2868-2875 (1993). Schäble, K.F. and Zachau, H.G., Biol. Chem. Hoppe-Seyler, 374, 1001-1022 (1993). Cox, J.P. et al., Eur. J. Immunol., 24, 827-836 (1994). Schäble, K.F. et al., Biol. Chem. Hoppe-Seyler, 375, 189-199 (1994). Hieter, P.A. et al., J. Biol. Chem., 257, 1516-1522 (1982). Hieter, P.A. et al., Cell, 22,197-207 (1980). Emorine, L. et al., Nature, 304, 447-449 (1983) (IGKJ-IGKC intron). Gimble, J.M. and Max, E.E., Mol. Cell. Biol., 7, 15-25 (1987). Judde, J.G. and Max, E.E., Mol. Cell. Biol., 12, 5206-5216 (1992). Dunham, I. et al., Nature, 402, 489-495 (1999). The orientation of the human (Homo sapiens) IGKV/OR22 locus on the chromosome 22 (22q11) is reverse (REV).